Kidz Bop 26 CD Giveaway! Fine Print: I was given a copy for review and Kidz Bop is giving a copy to a reader. All opinions and statements below are my own. The Kidz Bop 26 CD has been released! If you’re not familiar with Kidz Bop, this is “the most-popular and recognized music product in the U.S. for kids aged 5-12, featuring today’s most popular songs, sung by kids for kids.” And it really is! We have several of the Kidz Bop albums and my kids have always loved them. These are songs that you and I likely know by heart due to radio-play, but they are sung by talented children (usually three or four children per song if not more) and the lyrics are altered slightly in order to make them more appropriate for children. The kids have beautiful voices and do a great job with the songs on this CD. Story Of My Life, Timber and Best Day Of My Life are probably my favorite songs on this album, but they are all very good. The one song that feels a little odd is “All Of Me” (which is a love song from John Legend to his wife Chrissy Teigen), because they’ve had to change verses like “All your curves and all your edges” to “All your words and all your edges.” That being said, my kids are not the least bit aware of it and I do appreciate that the Kidz Bop CDs don’t force parents into having conversations with their kids that they may not be ready for yet (I can’t say that about the radio!) All in all, this is a great CD for kids. I am happy to let my children listen to it as often as they’d like. 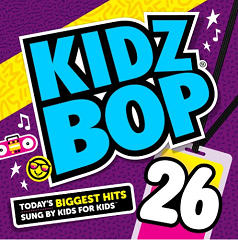 To get everyone excited about this new music, I am giving one lucky winner a copy of the Kidz Bop 26 CD! To enter this giveaway, complete any or all of the options listed below. Giveaway ends 7/29. Good luck! Say Something is my favorite song, but my daughter loves these cd’s and is already asking for a new one for her birthday, this would be a great surprise! I love let it go!!! I love the frozen movie!!! I would say Counting Stars because my nephew loves it and sings it when it comes on. I think the best day of my life would be one of my favorites. Kids love Let it Go…. I like quite a few on there. I’d pick The Best Day of My Life.